Moto2 world champion Johann Zarco has stolen the Malaysian moto2 Grand prix victory from Thomas Luthi, closing down the early leader to take the lead on the penultimate lap and pulling clear for victory. Luthi led almost from start to finish, but with track conditions rewarding those who were able to make the Dunlop tyres last, it was new world champ Zarco who was in the best position come race end. 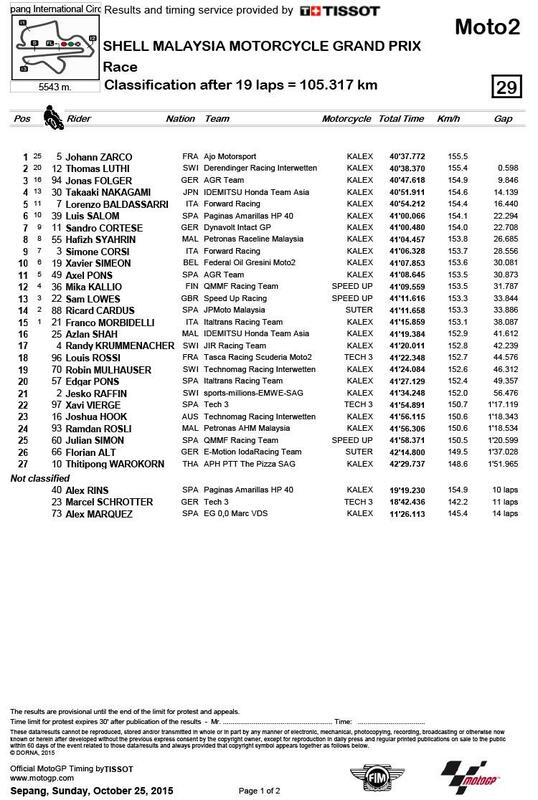 Jonas Folger took the final podium place, after both Axel Rins and Alex Marquez crashed out of the race early on. Sam Lowes, battling to retain fourth in the title from Luthi, suffered through the closing stages of the race, losing five seconds a lap before rallying back to just take points in thirteenth.